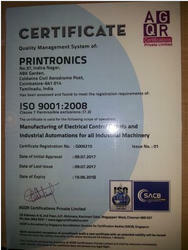 Our firm Printronics was established in 2005 as a prominent manufacturer and supplier of Electrical and Power Control Panels. We are a firm which is capable enough in delivering and managing a broad product portfolio consisting of Control Panels, Electrical Control Panels and VFD Control Panel. We are recognized as a deliverer of highly proficient product range which is enriched with various features. These features of the products facilitate the clients with wide number of facility and easing up their job. Our firm have gained a name in the industry and it is all because of the smart design, long functional life, and superior performance of the products. Moreover, we have earned ourselves a vast clientele base by offering superior after sales service. In these years, our firm has evolved as a noticeable firm of developing such equipments which controls the flow of electricity, the motion of pumps and motors and gives the client a reliable service. Since we started operating from then till now, we have learned the techniques and arts of making these products. We are backed with healthy infrastructure which enables us in producing greater amount of productivity. We have a team of efficient players, who are accountable for the making of these products and works round the clock in bringing out flawless products. In order to deliver excellence the entire process of manufacturing carried under the supervision of an expert and are minutely examined after being produced and before being supplied. Mr. N Aravinthan is the Managing Director who whole heartedly welcomes new ideas and follows very ethical business policy which helps the organization in achieving success. He has adopted client-centric approach and works to deliver them the best service. Ever since our establishment, ensuring 100% client satisfaction has been the sole motto of our company. We have always directed all our efforts and endeavors towards rendering high quality products to the clients as per their requisites. Moreover, we have recruited best professionals of the industry who procure superlative raw materials to ensure that the finished products are highly durable. Our excellent customization facility and installation services are highly appreciated by the clients owing to their promptness as well as efficiency. We have built up a huge infrastructural unit that is outfitted with one of the best machines available in the industry. Sprawled across an extensive area of 1200 sq.ft, our infrastructure helps in designing and developing an efficient array of products that are in conformation with the existing industrial standards. Furthermore, we have divided our entire infrastructural unit into several other sub-units, including production, quality testing, warehousing, packaging and dispatching. Functioning in a collaborative manner, these perfectly segregated units are managed and handled by experienced workforce having vast industrial experience. Our company is blessed with some of the experienced and skilled professionals of the industry, who have garnered wide knowledge base and rich experience of the concerned domain. The services of our dexterous professionals have helped us understand the requirements of the clients and therefore, develop products accordingly. The commitment of our team members has enabled us to offer superlative range of electrical and power control panels. Regular training sessions are conducted by us to enhance the knowledge base and polish the skills of our team of assiduous professionals. We are engaged in manufacturing and supplying a comprehensive array of electrical and power control panels. Following ethical business practices and adopting competitive pricing policy has helped us gain huge appreciations from the clients.